(NaturalNews) Leaders of the United Nations have historically had little use for national sovereignty. In fact, most have behaved as though they were the heads of a global governing body, despite the fact that this was never a founding function of the organization. Then again, the world's nation states have empowered the global institution with outsized authority, so it's little wonder it often operates as though it has the power to override national governments. One of the "authorities" bestowed on the UN has been the power to decide on the status of refugees – and then "assign" numbers of refugees to certain nations based on their ability to absorb and support them. Enter the Syrian refugee "crisis." Now, after the ISIS-sponsored Paris terrorist attacks on November 13, the UN is warning countries that had pledged to take in hundreds of thousands of them not to "backtrack" on those promises, even if fulfilling the pledges will put their own citizens at risk. In the days following the Paris attacks, which killed 129 people and wounded hundreds more, authorities learned that at least one of the attackers had infiltrated the West from Syria, where he posed as a refugee long enough to get a Greek passport. The revelation came on the heels of earlier reports that ISIS had planned such infiltrations in advance. In fact, ISIS officials themselves acknowledged that they would send jihadists into Western countries under cover of the Syrian refugee migration, a tactic the chairman of the House Homeland Security Committee has also publicly acknowledged. Indeed, in recent months U.S. officials have arrested almost 70 people throughout the country who were tied to potential terrorist plots, including some who came in as Syrian refugees. So why would President Obama continue to push for resettling more Syrian refugees in the U.S., even to the point of threatening "enforcement action" against states that refuse to accept them? And yet, the UN is as tone-deaf as Obama on this issue, warning sovereign countries against using the Paris tragedy as the impetus to back out of earlier pledges. The agency has even turned to propaganda in order to advance its resettlement agenda. A spokesman for the International Organization for Migration, Joel Millman, told Agence France-Presse (how ironic!) 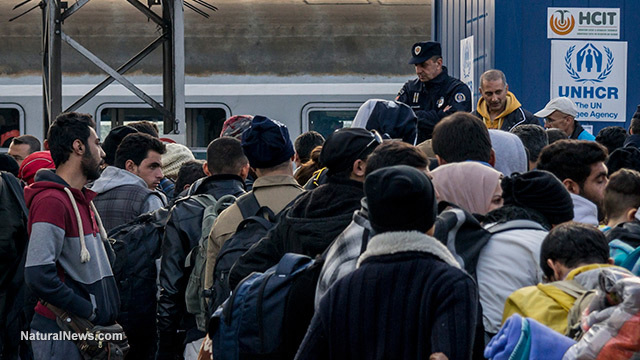 that of the 1.1 million migrants that have landed on European shores since 2013, fewer than a half-dozen "have raised questions in terms of possible links to extremism." And yet U.S. officials have already arrested more than ten times that amount and are tracking nearly 1,000 more. "French sources have said that a passport found near the body of one of the Stade de France suicide bombers may have belonged to a Syrian -- possibly an ex-government soldier -- who registered on the Greek island of Leros on October 3." But no matter. Despite the Paris attack's Syrian connection, the fact that ISIS has stated publicly it is using the migrant crisis to infiltrate more fighters into Western countries, the arrest of ISIS-linked plotters in the U.S. and the tracking of hundreds more, the UN is insisting refugee acceptance plans move forward without conditions from leery nations, and claiming that if they don't, those nations are racist and bigoted. "We are concerned about the reactions from some states to end programmes being put in place, backtracking from commitments made to manage the refugee crisis," UN refugee agency (UNHCR) spokeswoman Melissa Fleming told AFP. "Refugees should not be turned into scapegoats and must not become the secondary victims of these most tragic events," she added.